They came in their thousands, on a muggy evening at the end of August, to ask a simple question: "What's become of our missing boys?" 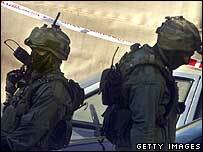 - the three Israeli soldiers, whose abductions triggered the parallel crises in Gaza and Lebanon. 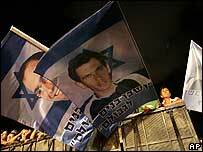 Their families, friends and supporters, gathered in Rabin Square - traditional home to Israeli demonstrations - to demand their return, with the country weary and frustrated by this latest, inconclusive, upheaval. A few blocks away, another "missing boy", a lone figure, tormented and filled with his own private despair, prepared to make his dramatic protest. His chosen spot, the modest, rather plain British Embassy, on a busy road close to the beach. Ignoring the security gate and the high metal railings, he neatly scaled an adjoining wall and dropped down into the embassy compound. Onto British soil. He then pulled a gun, said he wanted asylum in Europe and threatened to shoot himself. 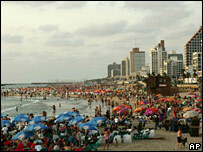 While traffic roared past, Israelis headed for the beach and the demonstrators gathered nearby, the gunman settled down for a long wait. Israeli anti-terrorist police and negotiators were quickly on the scene, but they were in no hurry either. They were there at the invitation of the British embassy and they wanted this to end without bloodshed. As the press gathered, watching the gunman through long lenses, we started to find out who he was. And why he'd decided to make this desperate bid. Nadim Injaz is a man without a home, without friends, afraid for his life, trapped by more than a decade of bad luck and bad decisions. His story sheds light on the moral corruption in the West Bank and Gaza Strip after 39 years of occupation. I talked to a human rights researcher who knows him and believes his story to be substantially true. As a teenager, in the mid-Nineties, Nadim was beaten up and his West Bank home destroyed when villagers found out that his brother was working as an informer for the Israelis. In Palestinian society, collaboration with Israel is a crime usually punishable by death. This hasn't stopped the Israelis recruiting thousands of snitches, sometimes through blackmail, often by offering badly-needed permits. Nadim moved to nearby Ramallah, but Palestinian militants caught up with him and told him if he wanted to stay, he would have to work for them. For a while, he robbed houses in Tel Aviv and Jerusalem, looking for guns. But eventually, he gave himself up to the Israeli police, who promised him that in return for becoming an informer, he would get Israeli identity papers, allowing him to stay. But nothing came of this either - after he was again beaten up by Palestinians, who knew what he was doing, the Israelis said they had no more use for him. He tried going back to Ramallah, but there was told if he wanted to live, he'd have to prove himself by killing an Israeli. Rejected by Israel and fearing death from his fellow Palestinians, Nadim drifted back into petty crime. He was in and out of jail - usually for being caught without the very Israeli permit he says he'd been promised. He'd spend a few months in prison, before being dumped in the West Bank. Each time, he would creep back. Earlier this week, at a Tel Aviv cafe, Nadim told the human rights researcher that he'd given up. He said he wanted to draw attention to the plight of others caught in the same hopeless situation. On Wednesday, he contacted journalists, telling them he was going to do something desperate. And so, there he was, slumped against the embassy wall, all options exhausted, asking for - but not really expecting to be given - asylum. Night fell and over in Rabin Square, the demonstrators, 40,000 strong, urged the country not to forget its missing soldiers. Two very different statements, but each rooted in the human cost of Israel's unresolved relations with its Arab neighbours. We stood across the road from the embassy, waiting for Nadim, or the police, to make a move. The beachgoers drifted home, pausing briefly to look, and sometimes to ask what was happening. Israelis have grown used to these small daily dramas - they glance up, wonder what the Palestinians are up to now, assess the level of danger and move on. Suddenly, in a flurry of bodies, it was over. Nadim was overpowered and taken away. The gun was plastic. As we left, well after midnight, the city's revellers were out in force. We switched on the news. For some reason, there was no mention of Nadim, or the missing soldiers.